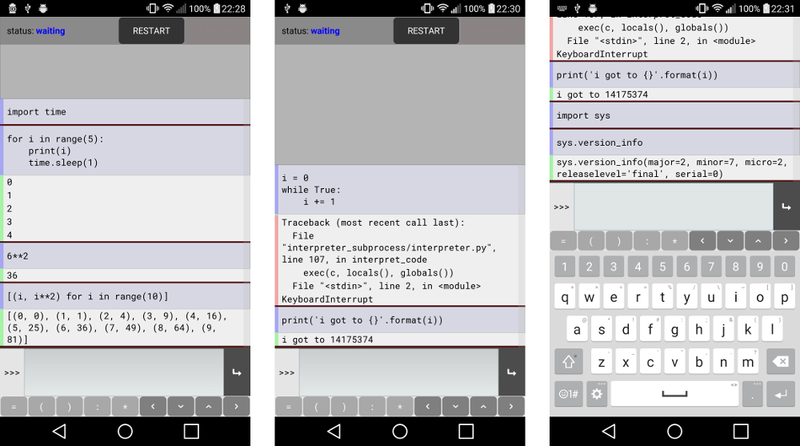 I put this together because I’ve always thought it would be nice to have a Python interpreter app that is itself written in Python, and in principle Kivy and python-for-android provide all the necessary components. In practice this worked even better than I expected, Kivy handled almost everything perfectly - I actually underestimated its maturity here! As part of the project, I’ve tried to round a number of corners that Kivy apps sometimes can to have, so that the interpreter (hopefully) behaves nicely in all situations. Within the interpreter, all of the standard library is available, and it’s possible to interrupt execution (equivalent to the normal ctrl+c behaviour) or to restart the interpreter process. No external modules are included yet except those necessary for the app to run, but I’ll probably include some major ones like numpy in a future release, and in the long term the aim is to support pip installs of new modules. This has also been a great stimulus for working on python-for-android; I’ve fixed a number of bugs, added several new features, and improved documentation in several places, just thanks to needing these things in a real app. On a technical level, Pyonic interpreter runs under Python 2, consisting of the app itself and a background Service running a second instance of the interpreter. I’ll be working on Python 3 support in the near future, in fact I originally wrote the app using Python 3 but switched to Python 2 partly due to incompatibilities in Kivy’s osc library (which should be easily fixed or avoided by just using a better communication library) and partly the more well-tested nature of python-for-android’s Python 2 build. The interpreter works by passing submitted Python code to the background Python process where it is parsed as ast and compiled in ‘exec’ or ‘single’ mode as appropriate to replicate the output printing behaviour of the normal Python interpreter. Doing things this way is a little awkward and feels like reinventing the wheel, although I’m not sure how to better achieve the same thing. An alternative might be to just call the python binary in a subprocess and manipulate its stdin/stdout - I’ll be looking into this option, but it doesn’t eliminate the need for message passing and may need some small changes in python-for-android, assuming also that android doesn’t impose any important limits on subprocessing. In the short term future, I expect to work first on releasing an improved version that adds a number of useful settings options (sneak peek in the image below), followed by working on a Python 3 version, and then to investigate some of these technical questions. I’d like to look into iOS support, as everything should work almost the same way there, but I don’t have the hardware or developer mempership for iOS development; if anyone would like to try it, let me know. Longer term, Pyonic interpreter is an experimental step towards creating a larger suite of mobile Python tools, in tandem with using this experience to improve python-for-android. There are many features to be added directly to the interpreter, but I’d also like to add surrounding tools including a full code editor, the ability to use pip to install other modules locally, and GUI support via additional Kivy activities. 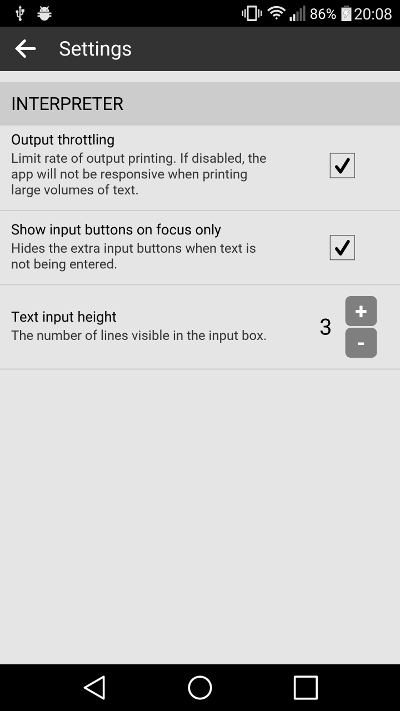 Settings screen in development to appear in the next release.